Looking back with hindsight 25 years on from The Playhouse in Derry opening for the first time, Pauline Ross said that becoming a major success story was neverconsidered part of the vision. Rather it was about staying true to the local people it was set up to serve. “I never gave that thought a thought and never will. We do what we do and we always do it to the best of our ability,” Pauline said. “For The Playhouse it was never about being a major success story but about always trying hard to live up to our vision and mission to serve the people and communities of this city and the North West. We are always aware that we need to keep our fingers on the pulse of our communities of interest and geography culturally, socially, politically and economically as well as it’s wellbeing. 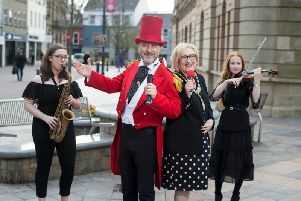 Today, The Playhouse is one of Northern Ireland’s leading arts and community venues and Pauline said the biggest milestone was the award-winning £4.6 million capital development project that restored and transformed the two convent schools into the much loved community arts and theatre venue that exists today. “Every day I give thanks to be able to come into such a beautiful and busy building to work alongside a great team dedicated and committed to the ethos of The Playhouse who never get tired or exhausted but always remain excited and creative in planning projects,[even the ones that don’t get off the ground] finding the financial resources to deliver them and working in partnership with whatever community it has been designed for. “Another milestone was in 1997 when we were the first Arts Centre in Northern Ireland to be accredited to deliver arts educational courses. Many graduates from our courses are now arts facilitators working across the city and beyond. Pauline said the most feel good milestone was the City of Culture year 2013. “What a year! With funding of just £264k we produced 13 theatre productions. One for every month of the year with one extra many of them telling a story about this place, its people and their histories. It was such a memorable celebratory year. Oh! If only we had that kind of budget again. Derry City Council and Arts Council of Northern Ireland are you listening? Pauline believes there is a creative energy in the historic Playhouse buildings that in turn fuels our energy. Today, around 50,000 people come through our door every year, roughly about 1,000 a week made up of theatre audiences and participants, Theatre companies, dance groups, community groups, special needs groups and special interest groups as well as the business community, and due to its uniqueness, Pauline said, it is also becoming a desired venue for weddings and conferences. Pauline said there have been so many highlights over the years that it is hard to single out just a few, but recalls how in 1993 during the war in Bosnia and Herzegovina The Playhouse produced ‘Peace Child International’ in partnership with the Peace Child organisation. She added: “Another theatre and peace building project, funded by The European Peace Funds, that we are extremely proud of was our Theatre of Witness productions. For five years from 2009 -2013 the founder and artistic director of Theatre of Witness, Teya Sepinuck came to live in Derry to deliver for us six theatrical productions along with Holywell Trust, our partner. “These productions involved victims and survivors, ex-combatants as well as security force personnel and played to packed theatres throughout Northern Ireland, the Republic of Ireland, England, Belgium and America. “The Playhouse production of Liam’s ‘The Bog Couple’ invites audiences inside one of the Rossville Flats for a ringside sofa seat as two men: one a slob, one a neat freak, one a Catholic, one a Protestant go toe-to-toe in what can only be described as the mismatch of the century.